Using an electric vehicles (EV) is a great way to reduce carbon dioxide emissions, as well as saving money on filling up. It is now easy and cost-effective to charge your EV at home with the right electricity plan. But what about when you are away from home on holiday? Fortunately, there are now hundreds of EV chargers right around the country, making it possible to travel from the Far North all the way down to the deep south. New Zealand has about 400 EV charging stations, according to PlugShare.com. This includes public stations open to everyone and business-installed stations, including some that are available only to paying guests. However, if you are travelling through the country or visiting points of interest in the regions, there are enough charging stations to keep your battery full. The top of the country has a good number of EV charging stations, in part to encourage more tourism. Unfortunately, the most northern public charging site, at Waitaki Landing, is not yet open but it due to open in early 2019. 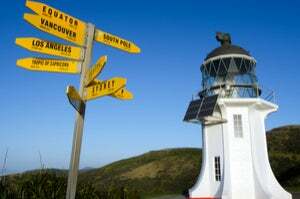 Waitaki Landing Holiday Park offers a station and is just 20km from Cape Reinga. Travelling along State Highway 1 down through Northland, there are public charging stations every 40-60km, although some are a slight detour off the main road. The only exception to this is the nearly 100km stretch between Kaitaia and Kawakawa. For EVs that don’t have large range, there is the option to avoid this stretch by choosing the more scenic State Highway 10, which offers chargers in Doubtless Bay and the Bay of Islands. There are public charging stations in all the main centres of Northland including Kaikohe, Whangarei and Dargaville. If you fancy staying at a beachside location, there are also plenty of accommodation charging sites, including at Taupo Bay, Russell and Marsden Cove Marina. Auckland, considered one of the world’s most liveable cities, has plenty of EV charging stations, with more than 20 in central Auckland alone. 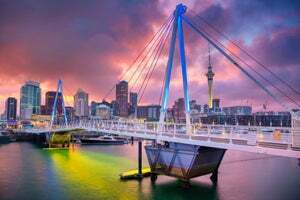 However, because of the motorways running through Auckland, most charging stations are not located on the state highway, and require a short detour off the main road. When travelling State Highway 1, most of these detours are not too far, such as Silverdale, Gilles Ave, Mt Wellington and Manukau. For tourists, there are also plenty of spots to visit thanks to business-installed charging stations, including at Leigh, Whangaparaoa and Piha. Those wanting to take their EV over water can charge up on Waiheke Island. Another highlight is the free charging at Wellsford district Library, thanks to a solar-powered charger. Waikato has a reasonably good spread of charging stations along its state highways. However, if you are heading to the Coromandel Peninsular from Auckland, there is an 85km stretch between charging stations in Takanini to Kopu. The peninsular itself is well serviced for those wanting to check out the beach-side action, with public sites including Thames, Coromandel, Whitianga, Tairua, Whangamata and Waihi. Travelling through the Waikato along State Highway 1, there are charging stations every 40-60km, including 14 in Hamilton, 13 in Taupo and five in Turangi. Other tourist spots in the Waikato with charging stations include Tongariro, Orakei, Raglan and Mokau. The attractive Bay of Plenty region has a number of public and business-installed chargers. However, these tend to be based around the main centres, with a few long stretches in between. Travelling State Highway 2 into the region, there are chargers at least every 25km, including six in Tauranga and four in Mount Maunganui. 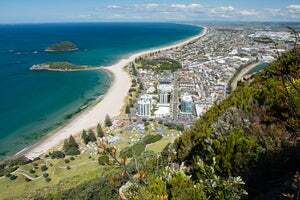 However, past the Mount, there is an 86km stretch before getting to the seaside town of Whakatane. From Whakatane to Rotorua there is another 85km stretch, and then 55km from Rotorua to Tauranga. While the tourist spots of Mount Maunganui, Rotorua and Whakatane are well serviced with chargers, there are also a few charging stations off the main highways for adventurous EV tourists. This includes Maketu Beach and Murupara. Charging stations in the Gisborne region are more spartan than more populated areas, and an electric vehicle with good range is needed to get around here. Following State Highway 2, there is a 72km gap from Opotiki to Matawai and then another 70km gap to Gisborne. The winding tourist trail along State Highway 35 offers plenty of charging stations – which is lucky, given the length of time needed to take this picturesque, seaside route. The Hawke’s Bay has a good concentration of EV chargers in the north of the region, enabling tourists to reach a number of popular destinations. Travelling from the north, there are charging stations every 20-45km along State Highway 5 and every 40-60km along State Highway 2, with chargers in all the main centres including Napier, Taradale, Flaxmere, Hastings and Havelock North. Travelling south of Hastings and Havelock North along State Highway 2, the gap between stations opens up again to 40-55km. Tourist spots off the main highways with EV charging stations include Mahia Beach and Te Awanga. EV charging stations through the Taranaki region are sparse and a good range is needed in this area. Travelling into the region on State Highway 3, there is an 85km gap between charging stations at Mokau and New Plymouth, although there are eight charging stations in New Plymouth. From New Plymouth, tourists can take the scenic “surf highway”, State Highway 45, although the nearest charging station is 62km away in Opunake. There are also charging stations in Stratford and Hawera, although it is another long stretch – 90km – from Hawera to Whanganui. Although the Whanganui – Manawatu region is vast, its EV charging stations are well spread out, ensuring the jump between stations is not too long. 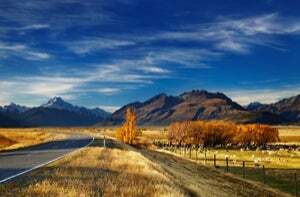 Travelling through the region on State Highway 1, the largest gap is 62km from Turangi to Waiouru. From there, charging stations are located every 20-55km along SH1. If travelling along State Highway 2, there are charging stations every 15-30km. There are also charging stations in all the major centres like Whanganui, Palmerston North and Levin. Tourist spots with charging stations include the ski area of Ohakune, Mt Ruapehu’s Whakapapa ski field, National Park and Himatangi. 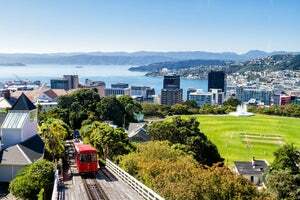 The Wellington region is well serviced with EV charging stations, with more than 15 stations in the Capital city alone. Travelling through Wellington region on State Highway 1, there are charging stations located at least every 20km, while on State Highway 2 they are located every 15-40km. There is also a good collection of charging stations in the main areas of Masterton, Featherston, Upper Hutt, Porirua and Lower Hutt. 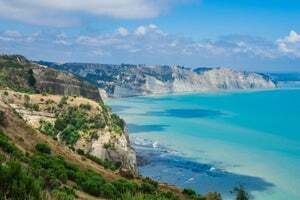 For tourists, there are plenty of charging stations along the Kapiti Coast, in wine country Martinborough, plus some out of the way locations like Castlepoint, Riversdale and Lake Ferry. Tourists travelling to the South Island need not worry about charging, while they relax over the ferry crossing. Marlborough has a reasonable number of electric vehicle stations spread through the region, including seven in Blenheim. Travelling through the region along State Highway 1, there are charging stations every 20km, although there is a 63km gap between Seddon and Clarence in Canterbury. Tourist spots with charging stations include Waikawa, Havelock, Pelorus Bridge, Rai Valley and Wairau Valley. The Nelson – Tasman region has a reasonable spread of EV stations, including three in Nelson and two in Richmond. However, the distance between stations does spread out once outside of the main centres. Travelling through the district along State Highway 6, there are charging stations every 45- 70km, although there is a near 100km gap between Murchison and the next charging station in Westport. If travelling to the tourist destination of Golden Bay, there are EV stations every 30-60km along State Highway 60. There are also charging stations at tourist spots including Pakawau, Stanley Brook and Owen River. Despite being the West Coast being sparsely populated, there are a spread of EV charging stations through the region, including three in Westport, four in Greymouth and two in Hokitika. Travelling through the region along State Highway 6, there are charging stations every 20-70km. The largest gaps are between Harihari and Franz Josef Glacier, and Haast to Makarora in Otago. As well as the stops along State Highway 6, there are charging stations at tourist destinations including Karamea, Reefton and Arthur’s Pass. Canterbury offers a good spread of EV charging stations, including about 40 in the city of Christchurch, four in Ashburton and five in Timaru, as well as in most of the smaller towns like Culverden, Geraldine, Farlie, Twizel, Oxford and Methven. Travelling through the district along State Highway 1, there are charging stations every 20-65km. Tourist spots with charging stations include Kaikoura, Hanmer Springs, Peel Forest, Tekapo, Waimate and Omarama. The Otago region offers a good spread of electric vehicle chargers, including six in Oamaru, eight in the city of Dunedin, four in Alexandra, six in Wanaka and 11 in the centre of Queenstown. There are also plenty of other charging stations in smaller towns dotted along the state highways through the vast region. Travelling along State Highway 1, there are charging stations every 15-40km, although there is a larger 72km gap between Balclutha and Gore. There are plenty of charging stations at tourist spots including Glenorchy, Coronet Peak, Cardrona, Cromwell, Naseby and Moeraki. EV charging stations are more spartan in New Zealand’s most southerly region, although there are stations every 30-65km along State highway 1, including four in Invercargill. Tourist spots with charging stations include Bluff, Tokanui, Manapouri and Te Anau.